Each signed limited edition print is accompanied by a Certificate of Authenticity. Following is an example of the Certificate of Authenticity that is supplied with each print. 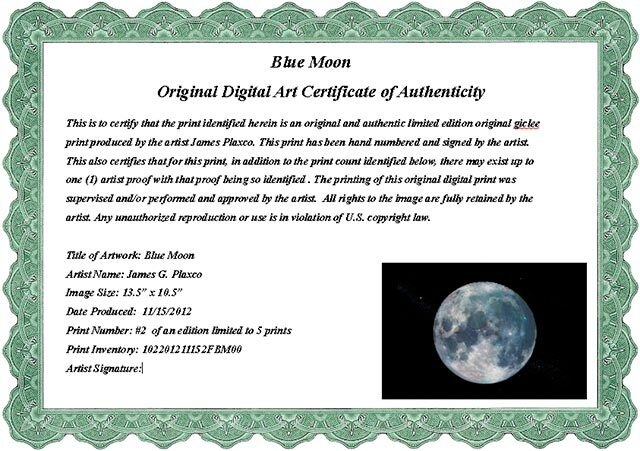 This is to certify that the print identified herein is an original and authentic limited edition original giclee print produced by the artist James Plaxco. This print has been hand numbered and signed by the artist. This also certifies that for this print, in addition to the print count identified below, there may exist up to one (1) artist proof with that proof being so identified . The printing of this original digital print was supervised and/or performed and approved by the artist. All rights to the image are fully retained by the artist. Any unauthorized reproduction or use is in violation of U.S. copyright law. Note that sole copyright to the associated artwork is fully retained by the artist. Any unauthorized reproduction or commerical use is in violation of U.S. copyright law.